Venice is a magical place to visit. It is unlike anywhere else in the world, it is sure to enthral you and your children. There is a romance and majesty to the city that, despite the crowds, evokes the glories of the past when trading from the East brought great wealth to Venice. 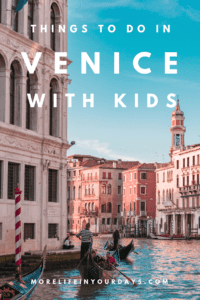 We think Venice is a great destination for families and in this post, we will share with you some of the best things to do in Venice with kids. Your children are bound to be enchanted by Venice, everything is just that bit different, there are canals instead of roads, you have boats instead of cars, the buildings are brightly coloured and you can eat pizza every day. As I said, it is just that bit different to everywhere else. Venice is easily accessible by all forms of transport. Train: We arrived by train at the Santa Lucia Railway Station. Walking out of the station is an amazing experience as you immediately find yourself in the heart of Venice right by the Grand Canal. Train services in Italy are cheap and reliable and we really enjoy travelling in this way. 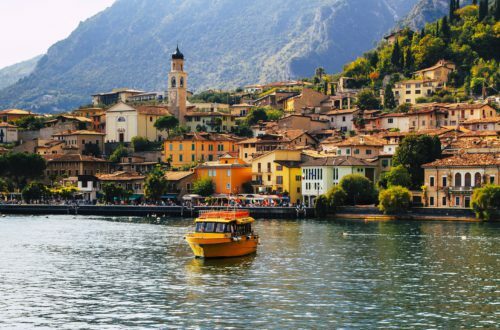 Check out our itinerary for travelling around Northern Italy by public transport. Air: It is easy to fly to Venice and there are two airports close at hand, Venice Marco Polo (8 miles away) and Treviso (23 miles away). We flew out of Treviso which was very easy to get to using the cheap shuttle bus. You can get low-cost flights from Treviso with Ryanair and others. Arriving at Marco Polo gives you the option of arriving in style by crossing the lagoon to Venice by boat. Feel like James Bond in a private water taxi or take the less expensive shared taxi boat. Car: Driving to Venice is possible but probably not the best option. You cannot drive around Venice itself but will need to park on arrival and pay upwards of 25 euros per day for a parking space. 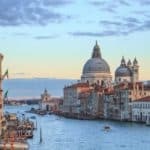 Sea: You can reach Venice by ferry from a number of locations, this website shows the routes and tickets. You will find a lot of people say that Venice isn’t a great destination for babies and toddlers, but I can’t say that we agree with this. We think that is a great destination for children of all ages and makes for a very family friendly getaway. Getting around Venice with a baby or toddler in a stroller can be a challenge with bridges, cobblestones and boats to negotiate. Many of the bridges are steep and have steps to get past with your pushchair. A few of them have ramps to help you get across but generally, you will have to carry the stroller up an over. This can be a bit of a pain, especially if you have loaded up the pushchair with everything that you need for a day of sightseeing, and have a sleeping child on-board. 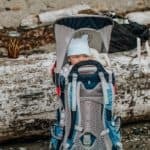 Over our time in the city, we alternated between taking our stroller and relying on our baby carrier, depending on where we were heading too. If you plan to get on and off the vaporretti, it is quite awkward with a stroller but it is manageable, if it is busy you may be asked to fold it up. Some areas, like the Santa Croce and San Polo areas, are fine to take a stroller, with wide flat streets and large piazzas. As we were arriving by train with a stroller and wheeled luggage, we picked accommodation near to the train station that could be accessed easily without having to negotiate any of the major canals. Getting around Venice with a toddler throws up the additional challenge of there being open water everywhere. You will need to remain vigilant but we do not think you should let this put you off visiting, just think of the canals as being like roads in any normal town. There are no roads or cars to worry about so it is quite toddler-friendly in that respect. Some parents like to use on reins to keep hold of their children for extra peace of mind. 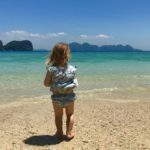 Now that we travel with a pair of toddlers, we are always on the lookout for parks and playgrounds in the towns and cities that we visit. Venice isn’t blessed with lots of wide open green spaces but there are a few places that you may want to include on your itineraries of Venice for kids, in order to keep the little ones happy (that’s what it’s all about isn’t it?). · Giardini Papadopoli: A lovely shaded park just south of the train station that has a small children’s play area. · Parco Delle Rimembranze: Towards the east of the island, this is a nice green area to laze beneath the trees and let your baby have a crawl around on the grass. · Giardini Della Biennale: Has a good playground for younger children. · Parco Savorgnan: This park in the Canareggio district has a couple of small playground and caters for kids of all ages. · Burano: There is a small playground near the ferry terminal on Strada di Corte Comare. A great way to get around the city is to take a vaporetto. This is Venice’s answer to a bus! These water buses cruise up and down the canals and can take you pretty much anywhere you want to go. Not merely a method of transport, we think that riding a vaporetto is one of the unmissable things to do in Venice. If you only do one journey by boat, (you should do lots), make it the trip down the Grand Canal on Vaporetto line 1. This is the classic journey under the famous Rialto Bridge and Accademia Bridge, and on to Piazza San Marco the heart of the city and home to the Doge’s Palace and St Marks Basilica. Along the way, you will pass the beautiful facades of the pallazi that line the waterway, all hinting at the faded glory of days gone by. 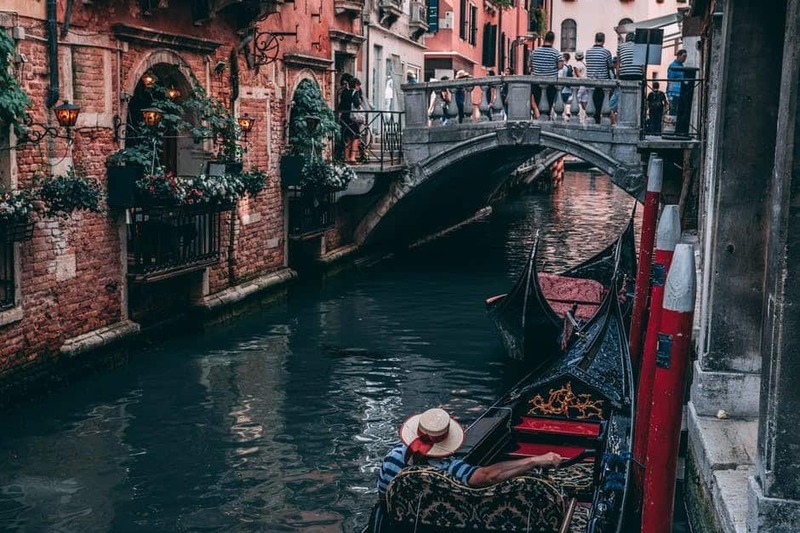 Not only this by you will see the workings of this great city from gondolas to rubbish collection boats, all aspects of city life are carried out on the water. Many of the spectacular palaces that line the Grand Canal can only be viewed from the water, so this is a great way to soak up the view. The beginning of the line is at Piazzale Roma, just by the train station so could be a spectacular first introduction to the city, although, depending on where you are staying, it will be more enjoyable to do it without your luggage. The journey is best enjoyed from the outside deck at the back of the boat, we didn’t have much trouble securing a spot here but it can get busy. You will encounter all the life of the city on these boats, from businessmen on their daily commute to the latest tourist arrivals struggling with their oversize baggage. If you are travelling with a baby you can expect the friendly Italians to coo over them and bring a smile to their faces. The vaporetti are an excellent way to get around the city and save your legs while soaking up some of the best views in the city. We recommend getting the tourist travel card that allows you to hop on and off whenever you wish, you can buy them to cover various time periods from 24 hours to a week. Children under 6 travel for free. The quintessential Venice experience. A feature of almost all the postcards and videos you have ever seen of the city, the gondola is Venice through and through. Gondola rides are big business and rates are not cheap. We really did question whether it was worth it but have no regrets that we gave it a go. 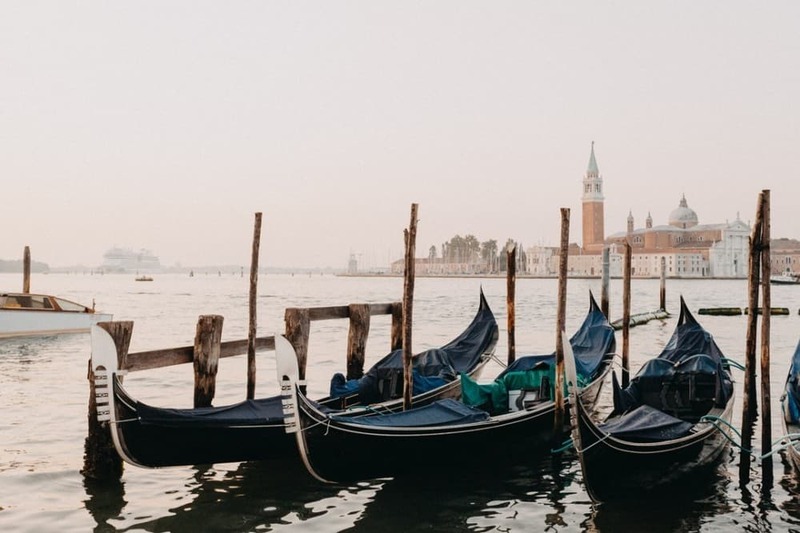 We recommend finding a gondola station away from the hubbub of San Marco and finding a route that takes you through the quiet backwaters along with a stretch of the Grand Canal. We took a boat from near the Accademia Bridge and the route had a good mix of quiet areas before a short, spectacular, section of the Grand Canal. The cost is a set rate of 80 euros for around half an hour, this goes up to 120 euros in the evening. You can book in advance here. A budget alternative would be to ride a Traghetto. These are less ornamental gondola ferries that can take you from one side of the Grand Canal to the other, covering the areas between the 4 main bridges, for 2 euros each. It is very brief but would give you a tiny taste of being on a gondola. 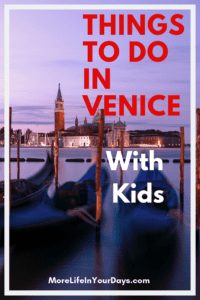 We think it’s worth having a proper ride though so that you don’t miss out on one of the best things to do in Venice Italy for kids. A really fun alternative to the standard gondola ride, especially with older kids, would be to have a go at learning to row a traditional gondola yourself in the quiet canals of Canareggio. In one of the more unusual Venice kids activities, you will receive full instruction in your own private lesson. Once you have mastered the basics you can take to the canals or even out into the lagoon for the final part of your lesson. If you get the taste for paddling the Venetian waters, another great way to explore the lagoon and backwaters is by kayak. They have double kayaks so kids from 8 years old can ride with their parents. A recent (August 2018) ban on kayaking has severely restricted the options for exploring within the old town, but there are one or two possibilities at restricted times, contact Venice kayak for the latest options. Although famed for its waterways, Venice is actually one of the best cities around for exploring on foot. It is compact and has wonderful architecture and new surprises around every corner. 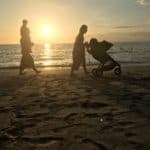 We think that wandering on foot is one of the best ways to get around, but be aware that your route will need to cross numerous bridges, making it more circuitous than you might have expected (especially if carrying your little one under the summer sun). We quite enjoy just wandering around and getting lost and often let our daughter pick the direction at junctions, But if you have a specific destination in mind, be sure to check the map to find out where the bridges are before heading off. Make sure that you wander around the pretty Cannaregio and Castello areas which are our favourite parts of the city. 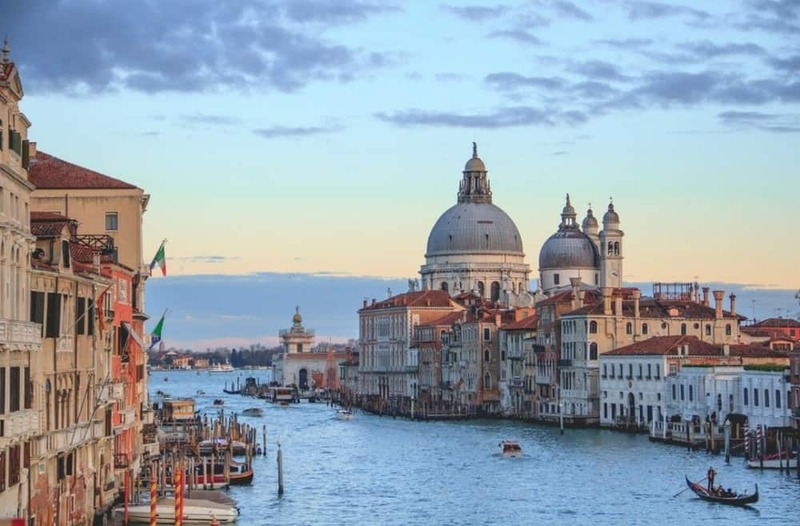 Away from the worst of the hustle and bustle of tourism you can enjoy the Venice of your imagination and experience a unique cityscape that has changed little in hundreds of years. Book a guided walking tour here. 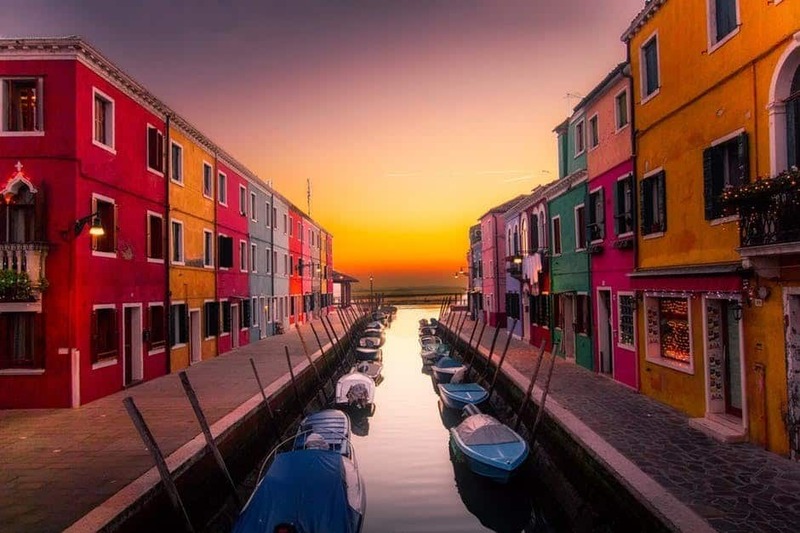 A great day trip from Venice is to visit the nearby islands of Murano and Burano. This can be done as a tour or by using the vaporetti. Murano – Closest to the city the island of Murano is a popular stop off for tourists. The island is famed for the quality of its glasswork and this is a good place to pick up some souvenirs. Be sure to stop in at a workshop to watch molten blobs of glass being transformed into delicate vases and figures. Burano – Burano is famous for its brightly coloured fishermen’s houses – a tradition that is said to have started as a way to help the fishermen find their way home in the fog. The island is also famous for its incredibly delicate and intricate handmade lace, although much of what you find on sale today has been imported cheaply from China! The buildings on the island do not have the grace and beauty of those in Venice itself but it is an interesting and colourful destination and exploring the islands of the lagoon by boat is great fun, definitely one of the top things to do in Venice with kids. When travelling with kids, a bit of time on the beach is always well received. You may not immediately think of beaches when you picture Venice kids activities (and they can’t compete with the best beaches in Sardinia), but the beaches of Venice Lido are nice and sandy and will be sure to entertain your little ones. 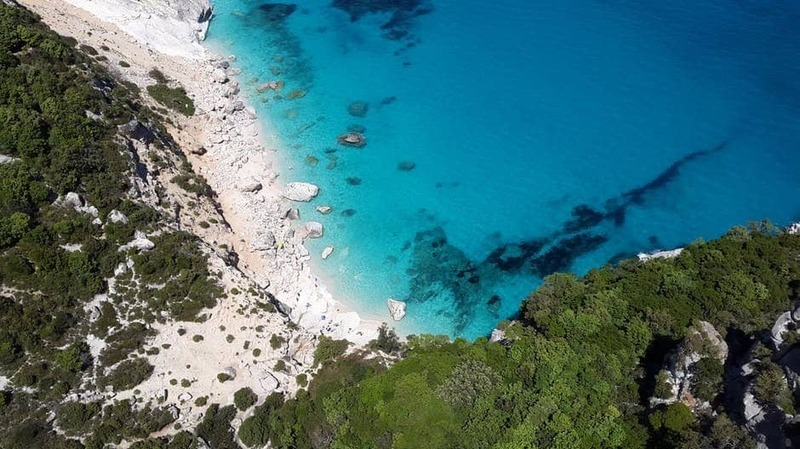 As with many beaches in Italy, a lot of the space is taken up by private beach clubs where you can rent an umbrella and deck chairs but there is a free area near to the vaporetto stop. For longer stays in Venice with kids it might be a good idea to stay in the Lido area to combine a beach holiday with trips across the water to the ancient city and the other surrounding islands. This would make for a fantastic week away. Piazza San Marco is the heart of the city and widely regarded as one of the world’s most beautiful spaces. Overlooked by the famous Basilica San Marco, the Campanile, Torre dell’Orologio (Clock Tower) and Palazzo Ducale (Doge’s Palace) it is a grand space with stunning architecture all around. Your kids will probably enjoy chasing the pigeons and watching the street entertainers as much as anything. The Doge’s Palace contains a world of riches and some fabulous mosaics. It also has some of the longest queues you have ever seen so to save your sanity it is worth getting a skip the line ticket or visiting as part of a guided tour. To be honest this wasn’t really our favourite part of town probably just because the crowds took away from the atmosphere a bit and there was scaffolding up when we visited. The nearby Bridge of Sighs viewpoint (where the Vaporreto stops), was uncomfortably busy. This is the only time we really felt this in Venice and maybe we just got our timing wrong, it is probably best to visit in the late afternoon when the crowds have moved on. Of course, you should go there whilst you are in Venice but make sure that you explore some of the lesser known spots as well. As well as the main square of San Marco, you will find loads of small squares (known as campo) all around the city. Most of these have an old well in them and this makes a favourite spot for kids to run around and play hide and seek. · Campo Santa Margherita a large square in the Dorsoduro area has plenty of space to stretch your legs. · Campo Santa Maria Formosa in Castello is a lively piazza named after the impressive church at one end. Lots of local children play here. A fun game to play in Venice with kids is to spot the winged lions that can be found all around the city in small squares, on churches, and on bridges. The winged lion is the symbol of St Mark and has become an icon of Venice. The largest lion, and one that is hard to miss, is on top of a column outside the Doge’s palace. Others will be harder to spot but this can be a good way to engage your children with their surroundings. If winged lions seem a bit tame, check out the 14th-century statue of a dragon at Campo Santa Margherita in Dorsoduro. If this kind of treasure hunt appeals to your kids you can take it a step further by taking on the Arte al Sole sketching treasure hunt, a great Venice attraction for kids. 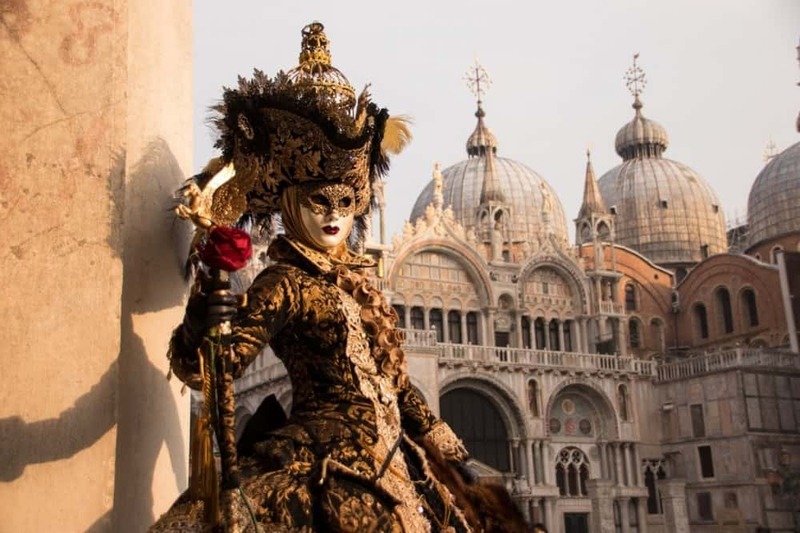 Venice is famed for its carnival and masked balls. You can watch artists making and painting the theatrical masks in tiny shops dotted around the city. Many of these are impressive works of craftsmanship and not for playing with but after watching them being made you can find some cheap tourist versions to try on or buy. If your little ones have been inspired you might like to try a mask painting workshop run for children. Ca’ Macana in Dorsoduro runs these in 2-hour sessions where you have a short history lesson (where you learn that all masks were plain white until 30 years ago!) and are then free to use your imagination to create a design that you like. This session is not really suited to young children, however crafty, and is probably best for those around 6 and up. One of our favourite spots in the city was San Giorgio Maggiore which offers great views back across the water towards Piazza San Marco and the Basilica di Santa Maria. It is a lovely, quiet, place to spend some time. Whilst we were sitting and enjoying the wonderful view I was asked by a passing tourist to act as photographer for a marriage proposal. She said yes! I hope the photos do justice to the amazing backdrop! For an even better view, you can take a lift up to the top of the tower for just 3 euros. It is a short hop across the lagoon on vaporetto line 2 from the San Zaccaria boat stop at San Marco. Accommodation in Venice is notoriously expensive and books up quickly so be sure to book well in advance to get the best deals and the nicest rooms. Although it is a little more expensive than elsewhere in Italy we were still able to find some reasonable options and you shouldn’t be put off by talk of how expensive the city is. This goes for eating out too which was not noticeably more expensive than elsewhere in Italy. Of course, if you want to splash out on accommodation you can stay in some pretty majestic buildings with truly unique views over the water. Our personal preference was to stay right in the historic centre of Venice to really soak up the ambience. 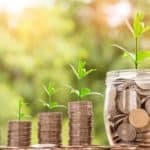 This will mean that accommodation is generally smaller and lacks the swimming pools and kid-friendly facilities that you may want for your trip. If you are visiting Venice for more than a couple of days, you could consider staying across the lagoon at one of the larger complexes that offer a full range of facilities, and the chance to escape the heat and crowds of the city. The Vaporetto runs across the lagoon and only takes 15 minutes to take you to the heart of historic Venice. 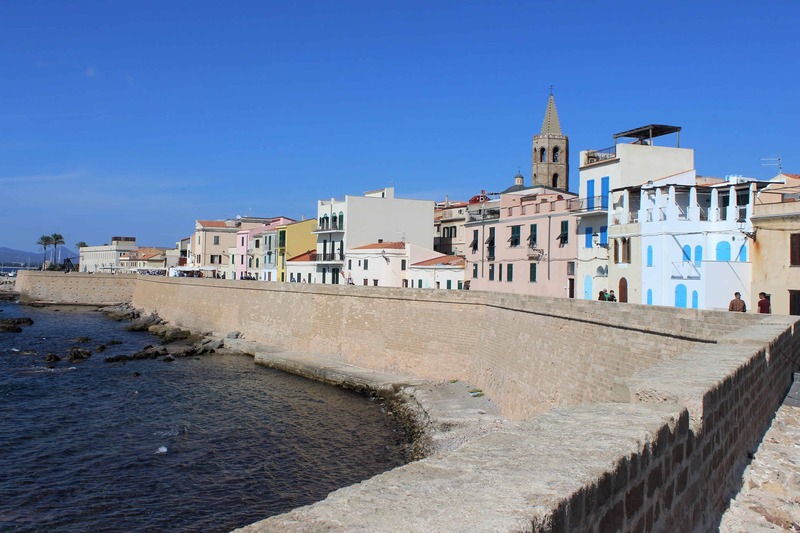 You can enjoy the view as you travel and we feel that this is a nicer option than staying in Venice, Mestre on the mainland. Camping Marina di Venezia 260S – By the Beach: Located in Cavallino-Treporti, this luxury campsite has an amazing range of swimming pools complete with slides and islands to play on and it is right by the beach making it an ideal base for families. Accommodation is in mobile homes with kitchenette areas and can sleep up to 6 making it a good value option for larger families. 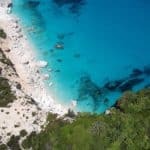 Looking to visit Italy and want to read more posts? We hope that you have enjoyed our thoughts on the best things to do in Venice with Kids. Whether you are travelling to Venice with a Baby, toddler or older kids, I am sure that you will fall in love with the city. It is such a unique place like somewhere out of a fairy tale, and will surely provide a memorable experience for your family travel adventures. There is so much to see and do in the city that we think any less than 3 days there would be cutting things fine whilst a week there will give you time to explore the nearby islands, spend time on the beach and really get to explore the less visited but potentially most enthralling corners of the city. I love Venice, It’s some time that I’ve been there but it still remains one of my favorite city tours. I was with a girlfriend, no children and it was very romantic. Now I’m a father and your Ideas of activity in Venice are very inspiring. It used to be quite expensive in Venice, is this still so? No problem but just to know. Thanks Stefan, Venice is generally quite an expensive place to stay but i don’t think it is too much more than the rest of italy, so don’t let that put you off from visiting again. Also, many of the activities mentioned above are free or pretty cheap so you don’t have to spend too much while you are there. Where we stayed was quite an affordable option. We have been looking for somewhere other than Disney to take our grandchildren on next summer’s vacation. The oldest is now 6 yo and the little one will be 3 yo by then. We traveled around the world with their parents and never had trouble taking vacations with them in foreign countries even when they were very small. The different sights and sounds are always fascinating to the growing mind. Venice sounds great. How difficult is it to get around only speaking English? Would you recommend we learn some Italian? We go to Italy every year and to our great shame have picked up very little Italian. You will get by fine just speaking English in Venice but it is nice to try and speak a few words in Italian if you can. English is not as widely spoken in Italy as many other European nations. Great to read a piece about a city I loved when I visited, even though when I did, I didn’t have kids. I loved how you highlighted activities to do there that are toddler and kid friendly. How right you are. Reading your smooth narrative and feasting on the wonderful photos, brought memories flooding back. Like yourselves, San Giorgio Maggiore was a favourite of mine too. The views from there are truly amazing. I’m also pleased you also mentioned the free beach area close to the vaporetto stop. It’s great place to spend some time, especially with kids. We know of course that Venice is sinking, so all the more reason to visit soon. Recently I also heard that the local population is decreasing at an alarming rate since locals just can’t cope with the tremendous influx of tourists. A photo of the fish market that it is literally half the size as I remember it, basically because the locals who used to buy fish have decreased so. How sad. Even though one visits Venice for the obvious unique nature of the city, it would also not be the same without the city’s wonderful people. Thank you for transporting me back down memory lane. I feel a great urge to return now, although it would once again be without kids as they are grown up. 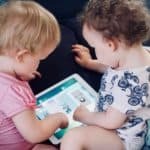 Had I read your post many years ago I would certainly have known exactly where to take them though, which will be very beneficial to others travelling there with children. I am so pleased to hear that you enjoyed our post. I have also heard that many locals are leaving the city, it is certainly a shame and does affect the atmosphere of a place. This is going to become more and more of a problem I suspect as travel become more accessible to people form all over the world. I know that it has already caused some tensions in Barcelona, it will be interesting to see how people and governments respond…. I’ve been to Venice in 2014 and it’s probably one of the best cities in the world. I don’t have kids as I’m too young for that but if you’re reading this blog post, you must try to visit this heaven. Chris, have you been to Venice before? The only country I’m planning to visit in the future is United Kingdom. Hi, we were in Venice with our baby daughter which helped to inspire me to write this post. You are right, it is surely one of the best cities in the world! We have some posts on the UK if you are heading here soon! Thanks for providing helpful information about Venice. Venice looks a nice destination for families and as you say, it is a bit different from other cities. I look forward to going there with my kids! I am looking for somewhere to stay, do you have any recommendations? We are looking for something really nice! If you are looking for somewhere a bit special you cant go far wrong with Hotel Palazzo Stern. I am sure you will have a great stay!!! 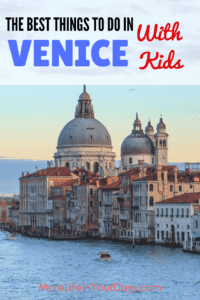 Thank you for sharing this great post on Things to do in Venice with kids.It is a great place for sure,the buildings are fantastic ,the view is attractive and above all water seems to be the main quality of Venice and It is a nice place to take photographs. When travelling with Kids it can be difficult as it is seems that main transport is boats .I wish I could visit Venice. Venice is great with kids and dont worry about the boats, they are great fun and it is easy enough to get on and off!! I’ve never been to any part of the world but it is my dream to go somewhere else and have a summer trip with my wife. 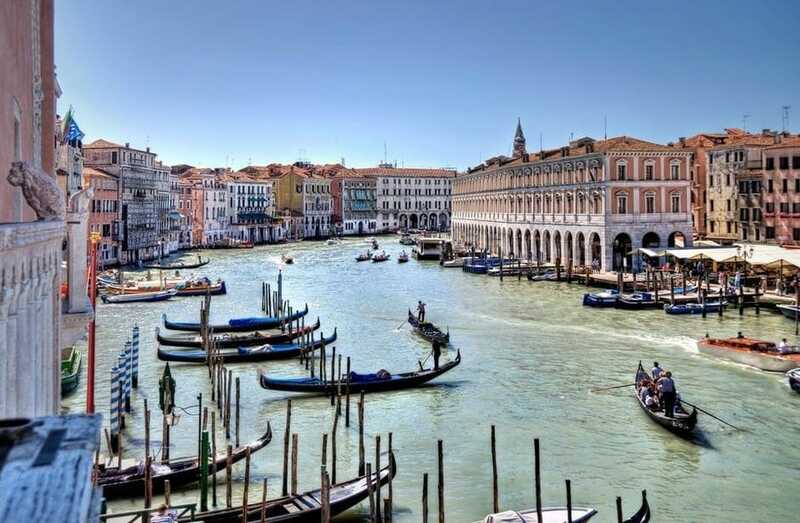 It is inviting to see the grace of Venice and its rich culture. I think it would be a happy experience to ride a Vaporetto, Gondola, or a Traghetto. I am now starting to save extra cash to treat my wife in our next vacation plan. Don’t you think there are also idealistic places in Venice for a couple to visit? We have no kids yet but still we really have a little time to talk with each other because of our daily schedule and workloads. Spending more time together during our travel is one of my habit to express my love and care to her. Venice is a famously romantic place so I am sure that you and your wife will have an amazing time! 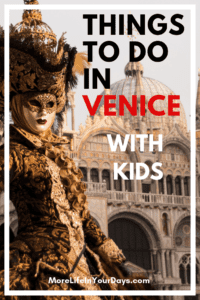 Almost all the things on this list would be great to do even without kids, and you will be free to enjoy venice in the evening when it looks even more magical!